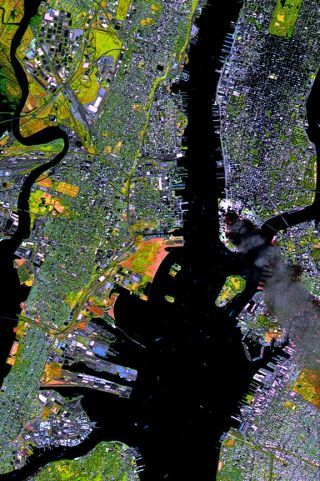 SPOT satellite image of Manhattan, acquired on September 11 at 11:55 AM EST, 3 hours after two planes crashed into the World Trade Center. The colors result from the use of infrared bands to identify the actual fire hot spots (see red spots near the base of the smoke plume). The SPOT satellites orbit at an altitude of 822 km. As the 10th anniversary of the September 11 terrorist attacks approaches, NASA is stressing the role that cooperative space exploration can play in making the world a better place. Projects such as the International Space Station help blur the differences that can pit nations and peoples against each other, highlighting instead what humanity can accomplish when it works together, NASA officials said. The United States had one citizen off-planet on Sept. 11, 2001 — NASA astronaut Frank Culbertson, who was commanding the International Space Station at the time. Culbertson had a bird's-eye view as the terror attacks on New York City's World Trade Center went down. "I didn't know exactly what was happening, but I knew it was really bad, because there was a big cloud of debris covering Manhattan," Culbertson recalled in a NASA video marking the 9/11 anniversary. "It was like seeing a wound in the side of your country, of your family, your friends." The attacks had a profound influence on Culbertson, and he said it's vital that the nation and the world continue to learn lessons from that fateful day. A veteran of the war in Afghanistan who was impressed that Culbertson had commanded the space station stressed one such lesson to the astronaut when the two men met. "The first thing he said to me was, 'That's one of the best things we're doing. We have to work together internationally, or we'll never solve all these problems,'" Culbertson said. Bolden voiced similar sentiments, emphasizing the bridge-building potential of the space station and other cooperative space efforts. "Frank Culbertson returned to a different world than that from which he launched," Bolden said. "But all of the space station's international crews have demonstrated how space exploration can bring our world together, erase borders and improve the lives of people across the world." NASA scientists and satellites were called into action in the aftermath of the 9/11 attacks, helping search for aerial contaminants near Ground Zero and monitoring the unfolding situation from above. And the space shuttle Endeavour carried nearly 6,000 miniature American flags on its STS-108 mission to the orbiting lab in December 2001 — the first shuttle flight after 9/11. After the flags came back down to Earth, they were distributed to relatives of the terror strike's victims. Further, NASA sent pieces of metal from the fallen Twin Towers to Mars. The New York-based company Honeybee Robotics, which helped build the twin Mars rovers Spirit and Opportunity, fashioned small pieces of aluminum from Ground Zero into dust covers for the rovers' rock abrasion tools. Spirit and Opportunity landed on the Red Planet in January 2004. Spirit stopped communicating with Earth in March 2010, but Opportunity is still going strong.